MENLO PARK, Calif., Oct. 2, 2014 /PRNewswire/ -- The just-released 2015 Salary Guides from Robert Half show that U.S. starting salaries for professional occupations are projected to increase an average of 3.8 percent next year. The largest expected gains in salaries among all fields researched are in technology, with an anticipated 5.7 percent overall increase in the average starting salary for newly hired information technology (IT) workers. Accounting and finance and creative and marketing professionals can expect starting salaries to rise an average of 3.5 percent, according to the research. "Hiring demand is placing pressure on the supply of skilled workers in many specialties, particularly in the technology and financial fields," said Paul McDonald, Robert Half senior executive director. "It's crucial for businesses to benchmark salaries to remain competitive, especially in a market where skilled candidates know they are in demand." The guides offer compensation data and hiring trends for 2015, as well as tips to recruit and retain top workers. Average starting salaries for accounting and finance professionals in the United States are forecast to rise 3.5 percent next year. Staff accountants, senior financial analysts and business systems analysts are in strong demand, and these professionals can expect to see higher than average salary increases. The regulatory environment is driving hiring for risk, compliance and internal audit professionals. Overall, base compensation for IT professionals in the United States is expected to increase 5.7 percent in the coming year. Mobile, security and big data will be three drivers for technology hiring in 2015. Mobile applications developers can expect the highest salary increases among all technology roles. 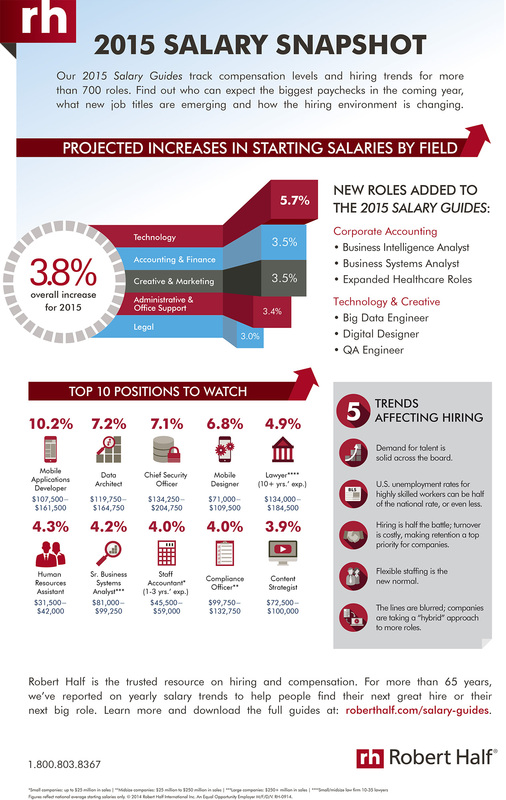 Professionals in creative fields in the United States can expect average starting salary gains of 3.5 percent in 2015. Growth in the digital space, particularly mobile, is driving the demand for professionals such as digital marketing strategists and user-experience specialists. Businesses also seek content strategists, web designers and front-end web developers. In the legal field, U.S. starting salaries are anticipated to rise 3.0 percent, on average, in the coming year. Law firms are seeking mid- and senior-level lawyers in high-growth practice areas, such as litigation, general business and commercial law, and intellectual property. Paralegals also are in high demand by companies and law firms, and those with specialized skill sets can expect higher starting compensation. Overall starting salaries for administrative professionals in the United States are expected to rise 3.4 percent in 2015. Demand for skilled executive and administrative assistants remains strong. There continues to be a need for support staff in healthcare, human resources and customer service. The 2015 Salary Guides from Robert Half can be accessed at www.roberthalf.com/salary-guides. Since 1950, Robert Half has produced Salary Guides to offer business owners, hiring managers and professionals salary information for their geographic areas and insight into the latest employment trends. Companies consult the annual guides to determine appropriate starting compensation for accounting and finance, technology, creative and marketing, legal and administrative professionals at all levels. In addition, the U.S. Department of Labor's Bureau of Labor Statistics has used the guides when preparing its comprehensive Occupational Outlook Handbook. Information in the guides is based on the thousands of job searches, negotiations and placements managed each year by Robert Half's staffing and recruiting managers, along with the company's ongoing surveys of executives. Continuing or ongoing salaries are not reported because many external factors -- such as seniority, work ethic, job performance and training -- impact the salaries of full-time professionals as work histories develop. Robert Half has more than 340 staffing locations worldwide and offers online job search services on its divisional websites, all of which can be accessed at www.roberthalf.com. For management and career advice, visit the Robert Half Blog at blog.roberthalf.com.